Is Klaus about to surrender? The Telegraph says so. He told a Czech newspaper: "The train carrying the treaty is going so fast and it's so far that it can't be stopped or returned, no matter how much some of us would want that." Earlier in the week it had appeared - according to The Times - that Klaus would NOT sign. If the Czech Republic does ratify the pressure on David Cameron will be enormous. William Hague has promised to annouce what "we will not let matters rest there" on the day that Lisbon is ratified (if it is). Only 16% of Tory members say a ratified Lisbon Treaty should be accepted. "With the EU piling on the pressure and threatening to strip the Czech Republic of its EU commissioner if the Lisbon treaty is not ratified, most observers feel that Mr Klaus will buckle. "He is confrontational but, in the end, he defends his own interests," says Jiri Pehe, a Czech political scientist and a former adviser to Mr Klaus's predecessor, Vaclav Havel. "That's why I think in the end he will sign." 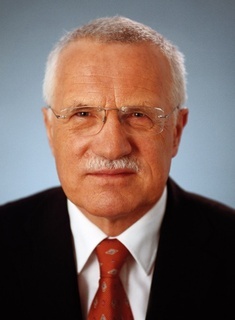 The President of the Czech Republic, Vaclav Klaus, may face impeachment if he does not sign the Lisbon Treaty according to The Economist's Charlemagne. "Well-informed types in Prague suggest the most effective pressure on him is the threat of being impeached for failing to perform his duties as president. Meanwhile, as first announced last week, a fresh legal challenge to Lisbon has been lodged by a group of senators close to Mr Klaus with the Czech Constitutional Court. The challenge seems doomed, but it could drag things out for a few more months. For some reason, the film Groundhog Day comes to mind." If, as seems likely, Ireland accepts Lisbon on Friday, Klaus will be the last, best hope of stopping Lisbon being ratified before the Conservatives come (we hope) to power. We recently reported that David Cameron may have lobbied him to hold back from signing. Over the next few months he may become the most hated leader in Europe by fellow EU politicians but a hero of all Eurosceptics. "If this treaty is still alive, if it is still being discussed and debated anywhere in Europe, then we will give you that referendum, we will name the date during the election campaign, we'll hold that referendum straight away and I will lead the campaign for a No. Now, if those circumstances change, if the Germans ratify, if the Poles ratify, if the Czechs ratify, if the Irish vote Yes to the treaty, then a new set of circumstances [apply], and I will address those at the time... I want us to be in the European Union. We are a trading nation, we should be co-operating with our allies and friends in Europe over things like the environment and crime, of course we should." "The problem is not global warming but the ideology which uses or misuses it -- it has gradually turned into the most efficient vehicle for advocating extensive government intervention into all fields of life and for suppressing human freedom." The Czech President was speaking in New York at a conference of climate change sceptics. Talking about existing methods of energy generation he said: "If someone wilfully abandons the existing technologies before new and far better ones are invented, he will only block economic growth." Mr Klaus also used his visit to America to warn against Barack Obama's current economic policy trajectory. "The best thing to do right now would be to temporarily weaken, if not repeal," business regulations on labor, the environment, social issues and health, he said. Janet Daley wants to import him to Britain. "While even many of the world’s most ardent free marketeers acknowledged the need for the recent coordinated bailout of European banks, Mr. Klaus lambasted it as irresponsible protectionism. He blamed too much — rather than too little — regulation for the crisis. A fervent critic of the environmental movement, he has called global warming a dangerous “myth,” arguing that the fight against climate change threatens economic growth. Perhaps his greatest ire has been reserved for the European Union. In 2005, he called for it to be “scrapped.” Now, he is a vocal opponent of the Lisbon Treaty, which aims to help Europe become more of an international player, but which he argues will strip countries of sovereignty. On a state visit to Ireland this month, Mr. Klaus incensed the government and annoyed many in his own country by publicly praising Declan Ganley, a businessman and political activist who was influential in persuading a majority of Irish voters in June to reject the treaty. And while other European leaders have criticized a newly assertive Russia, Mr. Klaus has forged close ties with Prime Minister Vladimir V. Putin and recently distanced himself from the Czech government’s criticism of Russia over the war with Georgia in August."